Four siblings. All Saints. 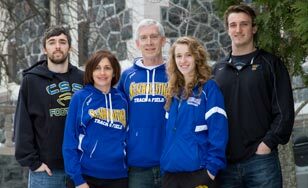 | The Kaplan family found a home away from home at St. Scholastica. For many families, the college years are a time when siblings begin to separate and move around the country for higher education. There’s less communication. Fewer visits. For the Kaplan family — parents John and Nancy, and their children Michael, Christopher, Nicholas and Jacqueline — it has been an opportunity for shared experiences. The boys all either played or currently play for the Saints football team. Michael ‘12, the eldest, knew CSS had the major he wanted to pursue (Computer Information Systems) and decided to visit the campus with his parents in 2008. An encounter with Head Coach Greg Carlson, the program’s inaugural coach, sealed the deal. According to John, they spent a good 45 minutes with Coach Carlson, and he spoke in detail about how the program would help his players develop character, maturity and integrity. 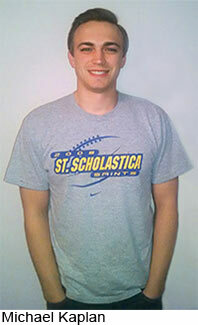 "We stopped at a gas station on the way home from St. Scholastica and without prompting, Michael said ‘I was impressed. I’d really like to go to CSS,’" John said. "Nancy and I also felt that CSS was the college that would be the best fit for Michael." It wasn’t just the football program. "I loved everything about the city, from the lake to Canal Park to the culture and atmosphere of the people who live there [Duluth]," Michael said. "Plus, I'd never seen a campus like that before; I was impressed when I saw Tower Hall for the first time." If you ask the younger Kaplans about navigating their path to St. Scholastica, they’ll tell you that constant questions from friends and family about following in their older brother’s footsteps initially dissuaded them from becoming Saints. But after years of attending football games in Duluth, each Kaplan found St. Scholastica had made a lasting impact. Christopher — who graduated in 2013 with a degree in Exercise Physiology and is now pursuing his doctorate in Physical Therapy at CSS — chose St. Scholastica soon after Michael. Next came Nicholas ‘17, who inherited his older brothers’ nickname, "Kap," the day he stepped on the practice field. "I almost wanted to go somewhere else just so everyone would stop asking," said Nicholas, a Computer Information Systems major. "But the beautiful campus and the success of the football program made St. Scholastica a natural fit." Jacqueline ‘19, who is a biology major and member of the track and field team, recalled that she was in sixth grade when she first visited CSS. The campus left her in awe. "It was so beautiful here and everyone was very friendly. Seven years later, I still feel that way about the College," she said. "It was a long process to choose, but in the end, I knew CSS was the one." Jacqueline plans to continue her education at CSS with a master’s degree in the Physician Assistant program. John and Nancy Kaplan have served for seven years on St. Scholastica’s Parent Council, a group that helps to collect parent ideas and concerns and convey them to administration. In fact, the Council worked with College administration to develop OneStop Student Services — a place to handle registration, student accounts and financial aid without visiting multiple offices. The Kaplans also help other parents transition to the changes of college life by participating in events during move-in weekend. This year, the Parent Council hosted a social in downtown Duluth where John and Nancy answered questions and gave advice to parents who had just dropped their children off at college for the first time. "When a son or daughter leaves for college, it’s difficult for many parents. We’ve had the chance to speak to other parents at freshman orientation, and it’s a great opportunity to answer their questions," Nancy said. All of the Kaplans agree St. Scholastica is a place where families can feel confident and comfortable sending their kids. "When we first came up here, everyone was so friendly; they all greeted us and made us feel welcome," John said. "Seven years later, it’s still happening, and I believe it proves the character of the College — everyone is so willing to help." The Benedictine Sisters have had a profound impact as well. John and Nancy have become friends with Sister Lisa Maurer and Sister Lois Eckes, and have enjoyed meeting many others. "We appreciate the influence the Sisters have on every aspect of the college, and all they have done to make CSS such a great place to send our kids," John said. Michael, who now works as a computer programmer with Twin Cities company Perficient, is convinced CSS is the kind of place where students can thrive, including his own siblings. "I look forward to them making their own memories of their time here," he said. "CSS does a great job of preparing you for the real world." "My main reasons for going to CSS were the chance to play football, the appeal of Duluth and the beauty of the St. Scholastica campus. I'd never seen a campus like that before — I was impressed when I saw Tower Hall for the first time."